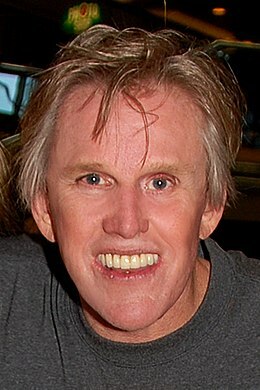 Gary Busey - Wikipedia, entziklopedia askea. William Gary Busey (1944ko ekainaren 29a, Baytown, Texas) estatubatuar zinema eta telebistako aktore bat da. The Buddy Holly Story (1978) filmean burututako antzezpenarengatik Gizonezko aktore onenaren Oscar Sariaren izendapena jaso zuen. Antzeztutako film nabarmenen artean honakoak dira: Lethal Weapon (1987), Predator 2 (1990), Point Break (1991), Under Siege (1992), The Firm (1993), Carried Away (1996), Black Sheep (1996), Lost Highway (1997), Fear and Loathing in Las Vegas (1998), The Gingerdead Man (2005) eta Piranha 3DD (2012). Telesaila hauetan ere agertu izan da: Gunsmoke, Walker, Texas Ranger, Law & Order, Scrubs eta Entourage. 1970: The High Chaparral; episode: "The Badge"
1971: Dan August; episode: "The Manufactured Man"
1972: Bonanza; episode: "The Hidden Enemy"
1973: Kung Fu; episode: "The Ancient Warrior"
1975: Gunsmoke; episode: "The Busters"
1975: Baretta; episode: "On the Road"
1985: The Hitchhiker; episode: "W.G.O.D." 1993: Fallen Angels; episode: "Since I Don't Have You"
1999: Walker, Texas Ranger; episode: "Special Witness"
1999: Shasta McNasty; episode: "The Thanksgiving Show"
2000: The Outer Limits; episode: "Revival"
2000: The Huntress; episode: "What Ralph Left Behind"
2001: Law & Order; episode: "Formerly Famous"
2009: Nite Tales: The Series; episode: "Trapped"